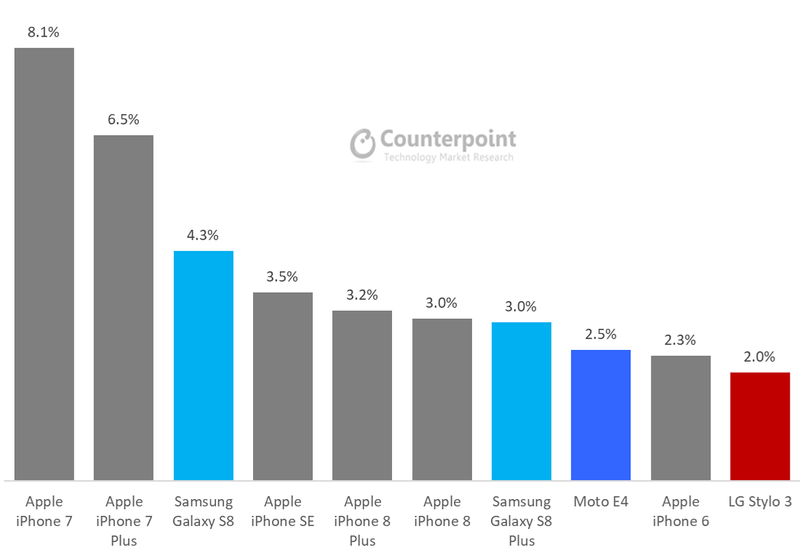 According to the latest research from Counterpoint’s Market Monitor program, US smartphone shipments remained flat during the third quarter of 2017. The quarter witnessed a highly competitive environment among carriers and OEMs in the prepaid segment. There were a few reasons for the dip in growth after 2Q17’s 14% YoY growth. First, the major carriers took a pause on the number of major marketing campaigns run including a much less aggressive iPhone 8/8Plus launch late in the quarter. In addition, the US market saw a significant number of Apple faithful opting to wait for the iPhone X.
Amongst carriers, postpaid upgrade rates remained muted during the quarter averaging 5.5%, down both YoY and sequentially. AT&T saw record lows at 3.9%. Sprint upgrades were 6.7%, high of the big 4 carriers. These lower postpaid upgrades showed US consumers expected higher promotional activity and opted to wait for the holiday season. US carriers added 750k prepaid subscribers during the quarter. MetroPCS, Cricket, and Boost remained strong. Offerings four lines for US$100 and free phones was the key modus operandi for these carriers. Even Verizon, who has not focused on prepaid, added 140k subscribers. Prepaid churn remains high compared to the decrease postpaid has seen. As a result, TracFone lost 365k subscribers and was the one which was hurt the most. Discontinued government subsidized programs have hurt volumes. In addition, with unlimited plans now everywhere, carriers are focusing on capacity for their quality smartphone base and doing less wholesaling. Apple continued to grow share within prepaid channels with its 6S and SE whereas 7 and 7 Plus held serve benefitting from multiple BOGO and trade-in offers by carriers during the back to school season. However, the new iPhone 8 series saw a muted launch, by Apple standards, highlighting that many seasoned Apple users were willing to pay or at least have a look before shelling out the US$1,000+ price tag for the iPhone X. As per our retail surveys, the iPhone X launch saw higher store traffic than last year. Checks showed 256GB memory configuration sold slightly above 64GB on its opening weekend. Apple’s guidance suggests the iPhone X will be a strong contributor of Apple’s mix in CYQ4. 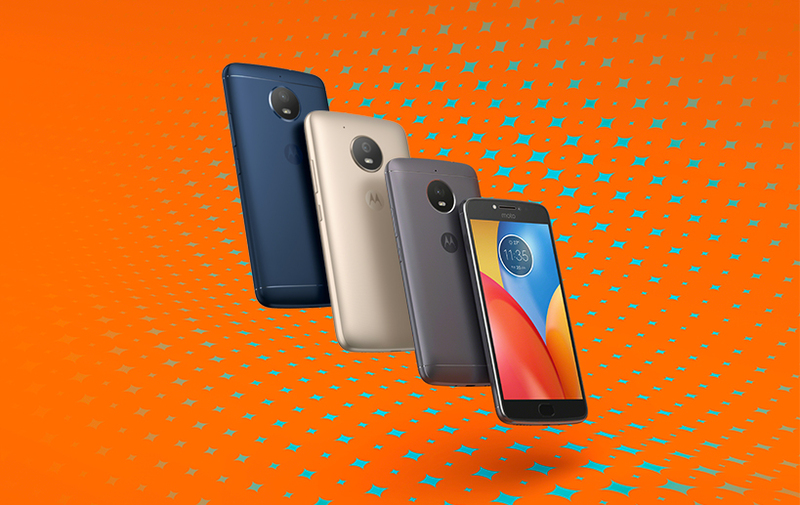 However, the star performer during the quarter was Motorola, which made a significant comeback almost doubling its volumes and market share annually and was the fastest growing brand in Q3 2017. This allowed the Chinese vendor to jump back into the top five rankings after a long time. Motorola’s focus on affordable devices for prepaid/unlocked market and breaking out from Verizon’s shadows helped drive growth during the quarter. This signifies that muscle memory for the Moto brand is still strong among US consumers. 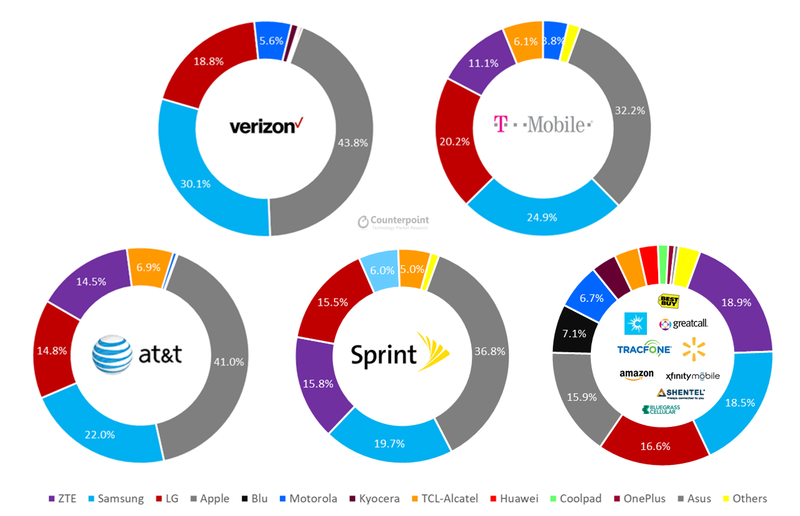 Motorola also benefitted in terms of visibility with presence across all four of the major carriers with its Moto Z2 Force Edition in premium segment. The Moto E series was the key volume driver for Motorola during the quarter across prepaid and open channels. Amongst the US carriers, Verizon had a good quarter and remained the biggest channel for smartphone sales, followed by T-Mobile, AT&T and Sprint. Sprint has almost caught up with AT&T in terms of smartphone sales as upgrade rates at AT&T have been the lowest. Apple led all the major carriers with robust demand for its older models, unlike in past, as the iPhone 8 series contributed little. Meanwhile, Samsung saw decent start for its Galaxy Note 8 after the Note 7 debacle. But, the overall volume growth slowed down due to the rise of Apple and LG in high-tier segments. LG had a strong quarter recording highest ever volume for the third quarter closing on Samsung volumes, especially at T-Mobile & Sprint. ZTE made strides in the prepaid segment with strong performance at Virgin, Boost, MetroPCS and Cricket channels. However, TracFone suffered the most during the quarter, as a result, Alcatel-TCL, which enjoyed stronghold at the prepaid giant, also saw its market position slipping. In terms of best-selling smartphone models during the quarter, Apple took the lion’s share capturing six out of top ten spots as iPhone 7 was the most popular smartphone in USA. The Moto E4 and LG Stylo 3 were also solid performers. Samsung volumes are always paused during iPhone launch season. However, the premium tier continues to have large value share, especially strong within Verizon and T-Mobile. GS8, GS 8Plus, and the Note 8 and their high ASPs dominated Android sales. The company has faced some challenges in the entry and mid-tiers being challenged by LG, ZTE, Moto. The company is also doing some variant pruning. LG grew its share to 17.6% and is gaining on its Korean rival, Samsung. G6 volumes were solid, but a fraction of Apple and Samsung flagships. K-Series and Stylus 3 continue to dominate value tiers. Key to LG’s success is R&D and sales logistics support across all four major carriers and open channels. ZTE grew its smartphone volumes 34% YoY. The company continues to be a top seller within prepaid channels with its value, large display offerings. The Max Pro continues to sell in multiple channels. The company launched the dual display Axon M, a unique media consumption device, within AT&T to kickstart a new form-factor revolution. 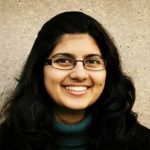 Despite not being a high-volume SKU, it will help the company gain mindshare and potentially help get the Axon-series ranged within other carrier channels. Alcatel has been challenged seeing its market share drop 4.1% YoY due to an aging portfolio, higher churn at TracFone and muted sell through of its BlackBerry Ownership control changes may be partially responsible for the delays of new launches and promotions. problems with the display. Google has worked hard to bring unique hardware to the market to convert some iOS subs to Android. However, to date, Pixel family device volumes have picked off volumes from Android OEMs. Essential phone has received some good reviews of its hardware, but has not moved but a few thousand units. Big price drops confirm limited take rates of this unlocked flagship. BlackBerry re-entered AT&T mid-Quarter attempting to be a B2B option. T-Mobile launched its first smartphone, the LG V30, on 600MHz Band 71. The network was turned on during Q3 and will be adding more devices in 4Q17 and 1Q18. 600MHz in a smartphone is no simple feat, but would be an opportunity for early OEMs, such as LG, because certainly the carrier will be wanting to get these devices out as soon as metros are lit up. T-Mobile – Sprint announced their merger talks have ended. Immediately afterwards, Sprint announced a MVNO deal with Altice USA. It is also expected to resume talks with cable companies including Charter.